For other people named Mark Murphy, see Mark Murphy (disambiguation). Murphy was born in Fulton, New York. He attended Colgate University, where he was also a member of the Theta Chi Fraternity and played college football. Before his NFL career ended and while playing for the Redskins he obtained an MBA from American University's Kogod School of Business in 1983. Murphy graduated with a law degree from the Georgetown University Law Center in 1988. Murphy played in Super Bowl XVII and Super Bowl XVIII with the Washington Redskins. 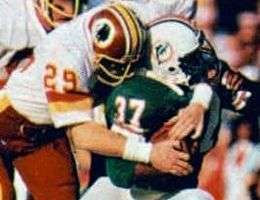 He played a key role in the Redskins 27–17 Super Bowl XVII win over the Miami Dolphins, recording a second half interception of Miami quarterback David Woodley's pass with the Dolphins on Washington's 37-yard line. Murphy's best season was in 1983, when he led the NFL with nine interceptions and returned them for 127 yards. He finished his eight season career with 27 interceptions and 282 return yards, along with six fumble recoveries for 22 returns yards, in 109 games. He also made the Pro Bowl in 1982 and 1983. Murphy was the Redskins representative to the NFL Players Association. He served on the bargaining committee in the players' strike that caused the cancellation of seven games during the 1982 season. Many suspect that the Redskins' decision to release him after the 1983 season and the reluctance of any other team to sign him was retribution for his union activity. Murphy moved back to Hamilton, New York, to become the athletic director at Colgate University in the early 1990s through until 2003. Later Murphy moved to in Evanston, Illinois to serve as the athletic director at Northwestern University. On December 3, 2007, he was revealed as the new Green Bay Packers President and CEO. On February 6, 2011, Mark Murphy's Green Bay Packers won Super Bowl XLV, giving Murphy his second Super Bowl victory. 1 2 3 "Mark Murphy". Green Bay Packers. Retrieved 2015-11-04. ↑ Clayton, John (March 28, 2010). "Packers' Murphy comes full circle". ESPN. ↑ "Mark H. Murphy Named Green Bay Packers President And CEO". Green Bay Packers. 2007-12-03. Archived from the original on 2007-12-13. Retrieved 2007-12-03. ↑ "Mark Murphy '77 Wins Second Super Bowl Trophy". Colgate University. 2011-02-07.